New Look Of London Ltd, established in 1985, has around 30 years experience as commercial window cleaners in East London, Bow, E3 and beyond. New Look commercial window cleaners in East London provide high quality Internal & External window cleaning for commercial clients. We utilise modern commercial window cleaning methods as well as conforming with health and safety regulations. Our commercial window cleaning service is accessible for a wide variety of buildings, including office blocks, apartment blocks, sports complexes, schools, business parks, car showrooms and housing estates. At New Look, we offer a reliable, regular fully insured cost effective service whilst being conscious of Health and Safety requirements. For commercial window cleaning in East London, Bow, E3 and beyond, choose New Look of London. We can ensure that your customers' first impression as they approach your premises is one of sparkling clean glass, rather than dingy glass. 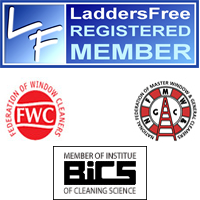 Our experience and commitment to offering you first class commercial window cleaning services in East London means that you can rest assured that we will not only deliver what you expect, but exceed your expectations. Contact New Look Window Cleaning Today! New Look Commercial Window Cleaning also cover Hackney | Stratford |Bethnal Green | Isle of Dogs | City of London | Ilford | Gants Hill | Barking | Beckton | Dagenham | Newham.